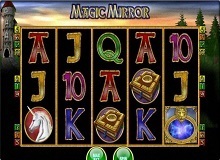 Magic Mirror slot is a fairy tale themed game introduced by Merkur, it’s inspired by the middle ages and fantasy novels. The graphics featured in the game is very simple and easy to understand, but yet very informative and creative. It’s very well animated and it’s shown clearly in the way the reels are moving. It also is compelled with a little cheesy background sounds but it is also very effective. You’ll feel the tension if you’re getting a scatter symbol during its falling from the noise that plays in the background, it’s the signal for the potential win of a bonus round upcoming. Overall, it’s more than pleased to spend time looking at. Magic Mirror casino slot online game is introduced with 5 reels and 10 paylines, the play lines in the game are all fixed and activated by default and not adjustable. This means that you’ll lose a little part of the control but it’s paid off with the amazing gambling feature it has. The gambling feature is being activated when you succeed to form a certain winning combination on the play grid, you will be allowed to put half or all of your winnings at stake in the gambling round. There will be two mini gambling games, the first one is as simple as that any player would choose the red or the black colored card, and there will be one of them winning. And the other gambling mini-game is a ladder game where you flip a coin to get a set up on the ladder or a step down on it. Every step up you take is increasing your payout while every step down makes you lose your bet. Magic Mirror free game is having an RTP of 95.94% cash back which is so close to the industry average. 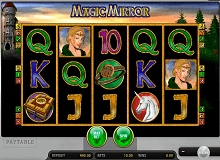 As mentioned above, Magic Mirror is unique among the casinos’ online games with its fairy tale theme. It features standard low-value symbols as well as higher value ones. All of the above in addition to the most special symbol here that plays three roles, it is the Magic Mirror itself. It works as the wild symbol of it and can substitute for any other symbol on the reels if needed to form the highest value combination for the round to be a winning round. It can also work as the scatter symbol in case there is more than one of it, and can also work as both at the same round if needed to form multiple winning combinations on different paylines. And the third role the Magic Mirror plays is triggered when there is at least three of it, besides the scatter payout, you will receive a bonus represented in 10 free spins. This is one of the very simple bonus features present. The other bonus features in the Magic Mirror game are not generous but it still pays out if you’re aiming to play Magic Mirror slot machine online for real cash. 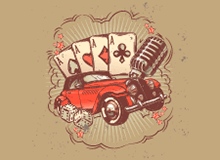 It might be your lucky day if you got any of the special symbols during the bonus rounds, this one doesn’t pay as little as the normal winnings, this one might get you the jackpot. This feature is assigning a certain special symbol for the free spin rounds. In case you were able to retrigger the bonus again, you’d be able to add another special symbol in order to get an accumulated big win. Magic Mirror might be a very profitable game, but you’ll need to create a tight betting strategy if you’re aiming for a big win. Optimal Rates: it is so not recommended that you bet at very low or very high stakes, it’s always recommended to choose a wisely medium sized stake. Doing this will leave you the chance of making decent winning and also making you avoid making century losses and maintain your positive balance. Since you’ll be playing Magic Mirror Slot for real money, you should know first that this is a short cycle game and your winnings will drop out sooner than you think. You’ll not need to play for a very long time to make a fortune from this game but you’ll be sure of not being in debt by the end of playing. Keep Playing: keep a track of the number of rounds you play as the number of bets you stake in Magic Mirror Slot has an impact on the number of winning combinations that can be formed. The more rounds you play, the higher the probability of winning you’ll have. 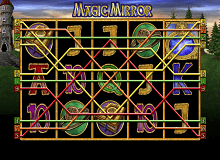 Overall, Magic Mirror slot was made with absolute care. It is a nice interface to look at and as well the sound and graphics featured in the game were made to be very smooth. The minigames raise the winning probabilities at the anti-cheats software.